Elvin Jones’s Large LP Shekere, $295 Repaired handle. Crack is visible in photos. 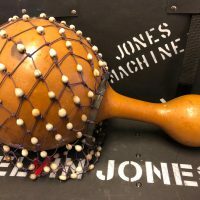 Part of a large collection of hand percussion instruments owned and used by Elvin Jones acquired directly from his estate. Includes COA signed by Keiko Jones.